This is a delicious and easily prepared side dish. The recipe uses the long, green sweet peppers (usually called frying peppers) as well as a couple of the hotter jalapeno peppers. The sauce is a lovely combination of Feta cheese and tomatoes - a tasty addition to any table! Rinse the frying peppers well, remove the stems and seeds and place on absorbent kitchen paper to dry well. Heat the oil in a frying pan and fry the peppers. With a slotted (draining) spoon transfer them to a shallow oven dish and add salt to taste. Spread the garlic on top, then the tomato and the chopped jalapeno peppers. Add salt to taste, but not too much as the feta cheese is rather salty. Sprinkle the olive oil and basil on top. 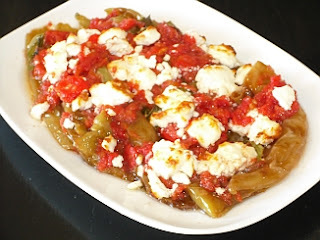 Finally, sprinkle the crumbled feta cheese on top. Place in a pre heated oven at 180 degrees Celsius for approx. 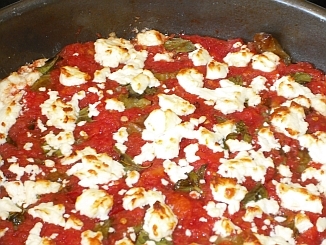 20 minutes, until the liquid has been absorbed and the feta colours (see photo below). I'll make this on sunday this weekend! Looks fabulous. I love cooking. I always try to make new homemade recipes.